Having struggled with back pain throughout most of my adult life I finally decided to confront the issue. Most of what I had read on the subject was either nonsense or solely designed to fleece the suckers: and there are no bigger suckers than those who are in pain. I was fifty at the time, weighed 165 pounds (75 kilos) on a 5’7” (170 cm) frame, and I had just put my back out for the umpteenth time and was in serious trouble. Serious enough for me to actually go and see a qualified physiotherapist instead of dinking around with the stupid chiropractor anymore. I was fortunate to find someone doing a placement in a local facility while she got her hours in on her master’s from the University of Western Ontario in London. She got me started on the road to recovery. First? Understand the nature of the problem. For this you will need information. There is a lot of junk out there – some of it thousands of years old – that will do you irreparable damage. Here is the best information I have ever read on the subject: http://www.amazon.com/Treat-Your-Own-Back-802-9/dp/0987650408/ref=sr_1_2?ie=UTF8&qid=1338618965&sr=8-2 by someone who is well qualified to write about it: http://www.mckenziemdt.org/robin.cfm. It was this book that the physiotherapist gave me to read, and it quite simply changed my life. Buy it! It is the very best advice you will ever get on the care of your own back and the non-invasive, non-medicated treatment of back pain. I have followed the exercises faithfully for more than a dozen years. I take fifteen to thirty minutes in the morning before I get out of bed, and I haven’t put my back out once since I started. Secondly? Change your posture! Yes, your mother was right, your posture is terrible. Now that you are no longer a teenager it might be a good idea to get over your resentment at her concern for your long term health and actually change your posture. You slouch; your chair is all wrong and your hips are misaligned, you shuffle and don’t walk by rolling from your heel to the ball of your foot and in fact your footwear won’t even ALLOW you to do this because you are still a silly slave to fashion! Get some decent shoes and wear them. Sit up straight and walk by allowing your hips to move naturally instead of locking them in place with that limping little shuffle thing you do. God gave you a body: enjoy it! Your body will thank you. Thirdly? Supplement the back stretches with other movements that will increase blood flow to the affected areas. Inflammation causes your back to spasm. Sure you can reduce the inflammation with medication, particularly ibuprofen (ditch the Tylenol; it is an analgesic, but it is NOT an anti-inflammatory). But you don’t want to be on that stuff forever. You must find ways to reduce the inflammation and carry away the fluid buildup that your body provides to shield itself from further injury. For that you need blood flow. And for the blood to flow and remove the fluid you need gentle physical movement. Therefore don’t do yoga or martial arts; do tai chi instead. The basic premise of yoga is that you get into some impossibly painful position and hold it. What? How does that help your muscles or your musculature? It doesn’t. It is so counterproductive that if yoga didn’t come with 3,000 years of arcane gobbledygook attached to it no one would ever follow it. But call it a quasi-religion and the gullible will line up for blocks. Almost everyone I know who has followed yoga has ended up doing themselves physical damage, some of it quite serious. And martial arts, while it may appeal to the young, is not something you want to be doing to your bones as they become more brittle with age. 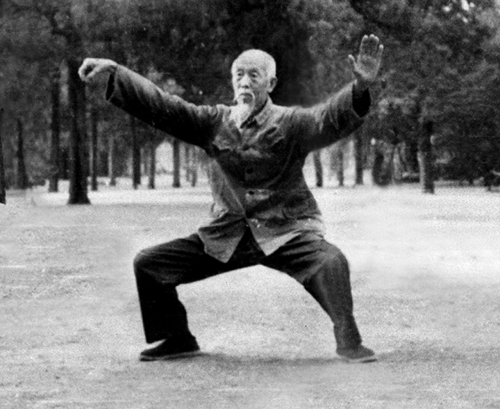 The basic premise of tai chi is that one motion becomes the next. You never over-reach and no movement is ever held, for holding a position is to halt the flow of your body’s energy and blood. Think of the difference between yoga and tai chi as the difference between a cut flower (lovely to look at, but stationary and dead) and a potted plant (living, moving) and you get the essential idea. When I was in university I learned the entire routine, but I am satisfied with a few modified movements that get my stiff muscles moving. Learn a few simple moves from youtube: http://www.youtube.com/watch?v=TBvF6r6DOvc but don’t stretch it out as far as this young lady does at first (the pink pajamas are optional). Keep your movements small until your back loosens up at little. Thirdly? (Yes, I noticed) Exercise. Sorry, none of the above actually qualifies; they are just essentially stretches to reduce the stiffness, inflammation and the resultant pain. Now that you are moving again you have to strengthen those weakened back muscles with exercise. I do four: swimming and climbing stairs – but that is only because they are readily available to me and they cost me nothing (we have a pool at our condo and we live on the thirteenth floor; sorry about your luck!) – walking and riding a bike. All of them address the back issue to some extent. You’ll have to find what works for you. But don’t stay wedded to something that actually damages you for ideological reasons. Sometimes the body is smarter than the head. Listen to your body and learn to help it heal. Finally? Lose the paunch. Extra weight anywhere can be a problem, but extra weight around the waist will take years off your life and put added strain on your back. I went from 165 down to 150 over about three years and then took another ten to get to 132 (60 kilos). Don’t do anything radical and don’t diet. Just be more intelligent about what you eat and drink. Beer is 150 dead calories, wine is 75. You could start there. Coke is 150 calories, Diet Coke is zero. Fried chicken is 400 calories per 100 grams. Baked or nuked chicken is 120. You have to look at your weight in the long term. It took you years to get to your present state; it will take years to change it. So change it; what have got to lose? Only the pain!